TOBACCO BEARS. Does someone you love smoke? Or recently quit? 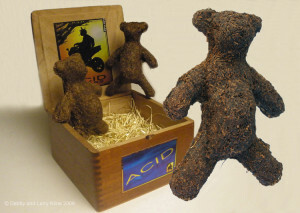 These are made of cigarette or cigar tobacco, lovingly shaped into little bears to cuddle. Each comes in his very own cigar box home (brands and labels may vary.) These icons remind us of cigarette companies ongoing marketing campaigns directed at children. Click here for full project description. *The tobacco is coated. Not for consumption. Price: $500 each (plus tax and shipping).